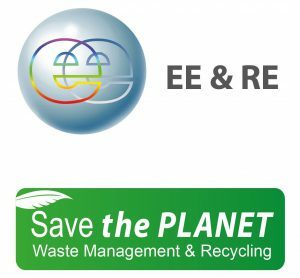 On 27 February 2018 the Environment Committee (ENVI) of the European Parliament has approved the legislative texts of the Circular Economy Package, which were agreed during the Trilogue negotiations. A similar vote in the Council (Coreper I) was taken a few days earlier. The final text on the Waste Framework Directive includes several aspects which will stimulate the management of biowaste across Europe. Separate collection of biowaste has to be implemented in all Member States by 31 December 2023! The European Compost Network (ECN) has summarised the main aspects related to biowaste in a factsheet which can be downloaded here. The legislative texts of the Waste Framework Directive (WFD) and on the landfill directive can be accessed here. Next, the European Parliament will vote in plenary on 17 April, after which the package is sent to the Council for final approval. The directives will be published in the Official Journal of the European Union shortly after. They will enter into force 20 days after this publication. Member States will have two years to transpose the new directives into national law. In the meantime, the European Commission will adopt implementing and delegated acts, that further specify details of the package. The annual Circular Economy Stakeholder Conference, hosted by the European Commission and the European Economic and Social Committee, took place on 20-21 February in Brussels.The primary goal of the conference was to discuss the latest developments in the implementation of the Circular Economy Action Plan (CEAP), to explore new areas of action and to share the first achievements of the European Circular Economy Stakeholder Platform. The video recordings of DAY 1 can be found on the event's website. The videos will remain available for two years. Furthermore, the highlights of DAY 2 will be soon made available on the event's website. In mid-February the second phase in the development of the ECESP website was completed. The new version enables stakeholders to submit good practices, national, regional, local circular economy strategies, voluntary commitments, and reports and studies via the Contribute section. The website will keep expanding and developing new, user-friendly and interactive features in order to foster dialogue and knowledge exchange across the circular economy community. 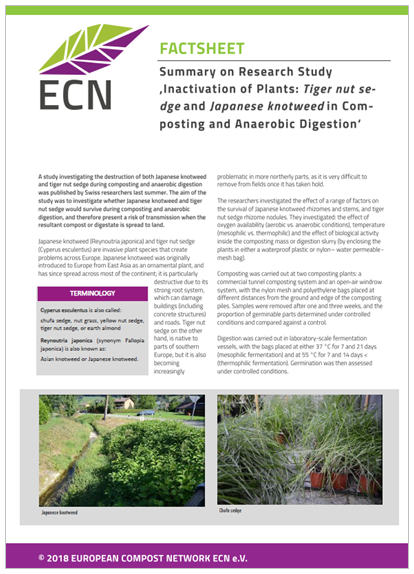 A study investigating the destruction of both Japanese knotweed and tiger nut sedge during composting and anaerobic digestion was published by Swiss researchers (FiBL) last summer. The aim of the study was to investigate whether Japanese knotweed and tiger nut sedge would survive during composting and anaerobic digestion, and therefore present a risk of transmission when the resultant compost or digestate is spread to land. 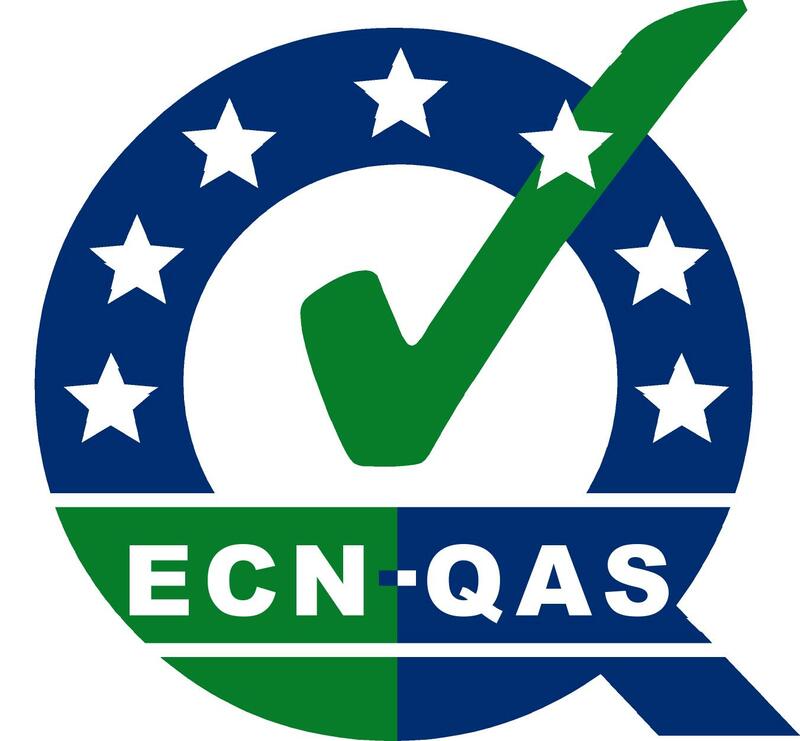 The outcome of the study is summarised in an ECN Factsheet which can be accesed here. The European Commission’s Joint Research Centre published its recommendations for introducing Best Available Techniques (BAT) for Waste Treatment in October. The document, which extends to 859 pages, covers a wide range of waste treatment techniques, including biological treatment, and has been developed as part of the Industrial Emissions Directive 2010/75/EU (Integrated Pollution Prevention and Control). ECN has summarised the most important informations in an ECN Factsheet which can be accessed here. This conference is organised by Cré and is discussing evolving policies with proposed changes to the brown bin regulations, a study on the household waste collection market, emerging new EU Circular Economy policies, new supports for heat from biogas by the Renewable Heat Incentive and the new National Statement on the Bioeconomy. The Irish Composting & Anaerobic Digestion Conference comes at a pivotal time for the sector and will create much debate, be thought provoking, informative and inspiring. The conference takes place today from 8:00h - 15:00h in the Killashee House Hotel, Kildare (IRL). More information can be can be accessed through the conference website here. The International Solid Waste Association (ISWA) and the LIFE programme are also part of the conference. The LIFE programme is the EU’s funding instrument for the environment and climate action. The LIFE session is going to be held within the frameworks of the Conference on Waste Management & Environment on March 28.